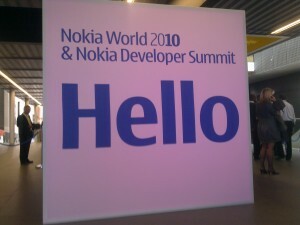 Yesterday was a really fun day spent at Nokia World, the Finnish handset maker’s annual shindig. Conveniently, this year it was held in my home city of London and I got to cover the event for TechCrunch Europe. On day one, Nokia unveiled three new smartphones running Symbian^3, the C6, C7 and E7, which I later had a brief hands-on with, along with the previously announced N8. I came away quietly impressed with subtle but extremely necessary improvements to the UI of Symbian, which also seemed snappier and in touch form really benefits from Nokia’s decision to (universally) switch to capacitive touch screens. The build quality on all four devices seems rock solid too, and the newly introduced ClearBlack screen technology “for improved outdoor visibility” and contrast levels was quite impressive too. That said, Nokia is still crying out for wider developer support to bring better and more third-party apps, but that’s also what events like Nokia World are for. Oh, and the other personal highlight of Nokia World was definitely meeting Chris Ziegler and Thomas Ricker from Engadget, and being recognized by the awesome Leila Makki of TelecomTV, along with a few other folks from Twitter. The build quality on all four devices seems rock solid too, and the newly introduced ClearBlack screen technology “for improved outdoor visibility” and contrast levels was quite impressive too. That said, Nokia is still crying out for wider developer support to bring better and more third-party apps, but that’s also what events like Nokia World are for.